As spring emerges, your warm-weather clothes hang tauntingly in your closet as a reminder that you still might have a little more trimming to do from that holiday heyday. Or perhaps you’ve gained weight through a major life change. You've had a baby, transitioned to a new job or you’ve moved. Whatever the reason, you’re probably reading this because you’re ready to join a gym. You drive by them and you see the flyers for free trials in the mail. One friend tells you to go to her gym and another friend tells you hers is the best. In a town that ranks one of the top 10 healthiest cities in the U.S. and hosts about five dozen gyms, you’re still left unsure of which gym to join. You are sure of this though: you’re ready to join the fitness movement. Before diving into the cracks of every local gym, first ask yourself, what kind of body do you want to achieve? CrossFit, for example, will give you a different look than yoga. Heavy weight-lifting will give you a different look than Pilates and barre. Most modern women I know want a long, lean and toned body. This means incorporating clean and mindful eating into their diet as a base, cardio such as running, mindfulness and stress management such as meditation and specific toning, resistance and stretching exercises. This is where the top gyms in Fort Collins come into play to achieve this long, lean, look through yoga, Pilates and barre. “You’ll move like you never have before." I have tried Pilates and Barre from private local instructors, at three of the big gyms in town and on at least 10 home workout DVDs and yet I have never seen more of a difference in my body than with the boutique gym Powerhouse Pilates. Perhaps it’s the small, personalized classes and the attention you receive that bigger gyms can’t give you. 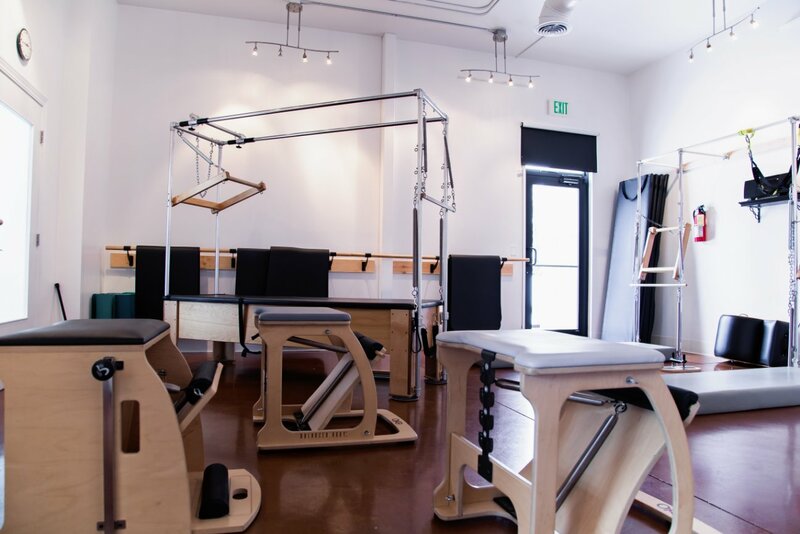 The first thing you will notice about Powerhouse Pilates is that it is a small gym. Although its expansive, sun-filled windows light up this high-ceilinged building which holds two studios for Pilates and barre, Powerhouse Pilates is not meant to trickle in the masses. 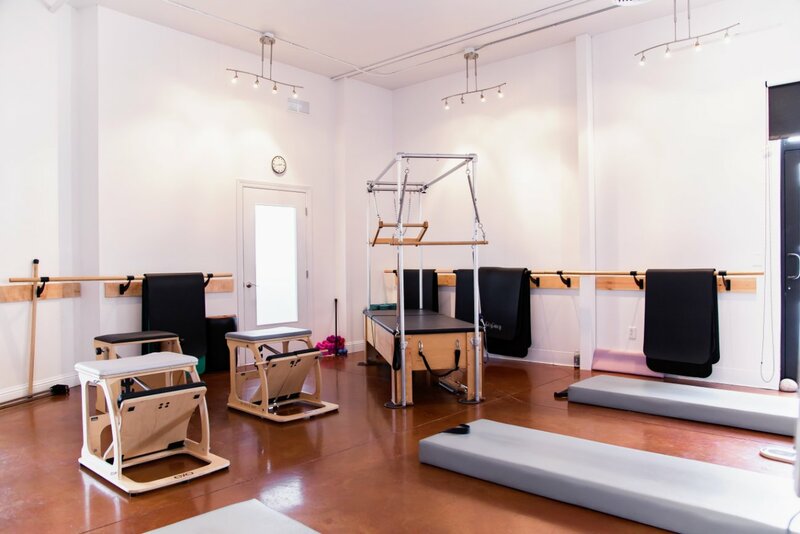 Powerhouse Pilates is for people who want customized workouts to achieve a long, lean body, whether they are popping in to work out solo, or they’re taking one-on-one private classes with a personal trainer or taking a group Pilates or barre fitness class. “You’ll move like you never have before,” says Hope Glazener, M.S., Owner and Teacher at Powerhouse Pilates. Both barre and Pilates combine strengthening and stretching for the long, lean, look. After just one class, you’ll notice a difference, mainly in your posture. People are intrigued by this type of workout and the lean, toned body they achieve from it keeps them coming back. Powerhouse Barre Fitness classes are my favorite workout classes. Inspired by ballet and immersed with other practices such as yoga and Pilates, barre classes have sprung up all over the U.S. within the last few years. The long, lean, look comes from precise movements that fatigue all the muscles that Powerhouse Pilates incorporates in their upbeat 50-minute classes to get the heart-rate up. You’re in constant motion, and even though you may only be lifting 3-pound weights, you’re exhausted (in a good way)! You feel as if you can barely lift another. “You go to where you can’t do another rep and then stretch the muscles out,” says Hope. Pilates originated from Joseph Pilates, who created a series of controlled, precise movements to overcome his physical ailments from childhood. Since then, the Pilates movement swept from the early to mid-1900s mostly in the dance community until it flooded mainstream fitness after 1980s. 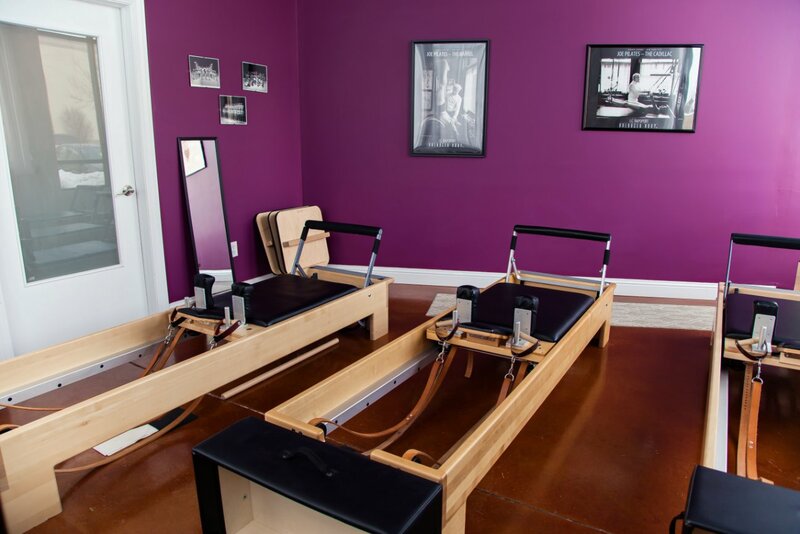 Pilates offers a variety of classes: apparatus, reformer, tower and mat classes. Pilates can be done with no equipment on the mat or in studio classes with special machines equipped with springs, pulleys and straps for muscle strengthening and lengthening. 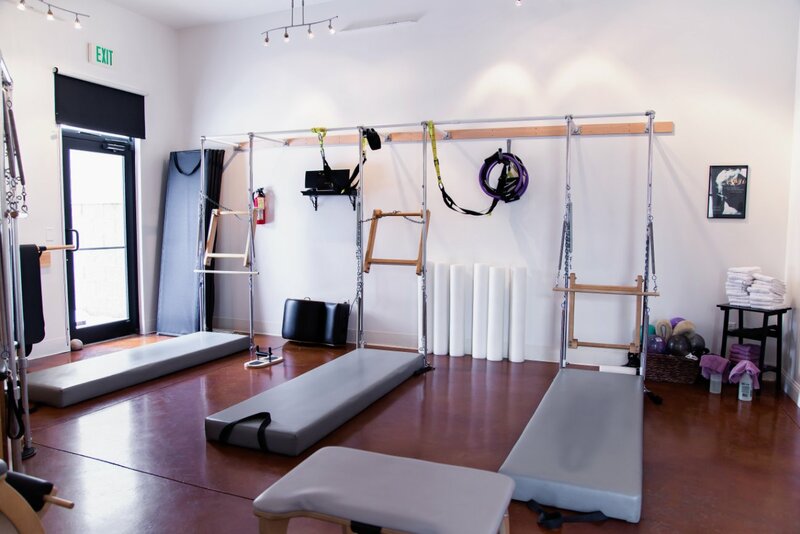 But through all Pilates – whether private or group classes - the focus is on efficient, controlled movements. “Pilates acts intrinsically like our muscles. It makes sense to the body,” says Hope. Strength, stretching, stability and stamina: through Pilates, these four components work the muscles functionally. Getting an efficient workout is not about feeling sore, Hope reminds us. It’s about efficient, controlled (not to be mistaken with slow) movements. In a society that pushes harder, faster, stronger and longer, Pilates emulates a mind/body connection to not only work the big muscle groups but small muscles as well. For example, people normally overwork their quads, but Pilates (and barre) target all the muscles in the leg so you tone uniformly. Who can do these workouts? Everyone. Pilates and Barre are therapeutic and a great workout. Powerhouse Pilates works with the 12-year-old figure skater as well as the 70-year-old and the career woman. People who join Powerhouse Pilates are of all ages, all ages, all sizes and all abilities. Special: First class is free! 15% off your first class series purchase. The spiritually-based 5,000-10,000-year-old yoga practice that originated in India has now erupted into thousands of Western yoga centers featuring a variety of classes and inspiring the speedy popularity of yoga-wear everywhere. For now, we’ll bypass most of the lengthy core of yoga’s origins of dismantling the ego and expanding self-knowledge through awareness and just focus on mostly the physical aspect. Yet yoga can never be purely physical. 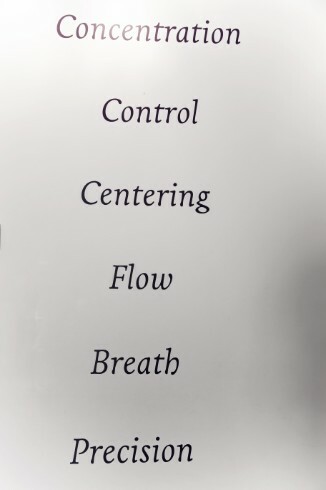 Part of the magic of yoga is the mind/body connection as well as the different positions that energetically connect you to your higher self and allow energy to flow freely throughout the body. Even if you intend to take yoga classes as a means to an end (for that long, lean body you’ve witnessed from so many yogis) you’ll get much more. The most powerful part of our body is the mind and what yoga does for everyone is that it creates mindfulness in all areas of your life. Getting a trim, long, lean body comes from being centered and mindful first before you take any kind of action – whether eating, exercising or any other activity. It also greatly reduces stress and in our society where most people’s adrenal glands are off-balance (contributing to weight gain and other bodily ailments), yoga is a soothing medicine for our fast-paced life to center and ground us. Fort Collins offers yoga-specific studios such as Old Town Yoga, Om Ananda Yoga and Santosha Spa but yoga is also offered through the mix of classes at some of Fort Collins' bigger gyms such as Raintree Athletic Club and Miramont Lifestyle Fitness. I currently have a membership to Raintree because I like the variety but Om Ananda Yoga is one of my favorites. You'll know your favorite gym for yoga after about a week of trial classes. Danine M - I've been wanting to try Barre - thank you for the info. 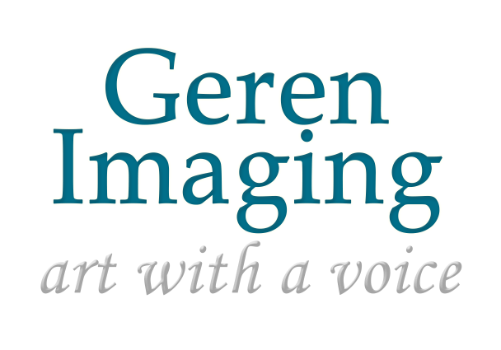 Lynda Colter-Bergh - I've always wanted to try these. But, I've been completely intimidated that I'll be too out of shape to start these. But I know diem is important, so I don't want to do it at home and end up hurting myself. Are these classes appropriate for total beginners?